OUR PRICE: $11.78 - Join Rewards Get $1 Dance Dollars On This Item! Capezio Teletone taps, sound board included. For correct tap sizing or to learn how to place the taps on your shoes, please call customer service or consult our tap fitting guide. Tap sizing is specific to the style # of shoe you are fitting them to. Taps are priced per pair of heels or toes. You must specify heels or toes when ordering. To order both heels and toes, add both items to your shopping cart. Heels and toes are specified by choosing the appropriate size. Glad to see they now come with the soundboard included. I bought these about 4 years ago and it took me a full year to find a cobbler who could put them on my shoes because none of them knew where to get a soundboard. The quality is fine and they make a decent sound but I wish Bloch sold their taps. Because it was such a hassle to get these put on my shoes I am only giving 3 stars but they may be better now that the soundboard is included. Hello. I bought these teletone taps for my daughter for her dance classes, and she loves them! They are exceptional compared to her old taps, which didn't make any noise. I am glad she now is passionate about her tap shoes and her career as a flapper! Does,each tap come separately? So,if I order,one it would be $13 but if I order four it would be $32? Or do all four 2 heels 2 toes come in the order? Hello! Thank you for contacting us. The taps are sold in sets o two. You would need a set for the toes and a set for the heels. Where can I find a smaller heel size?. The heel on my Capezio 700 T strap seems to be too small for the H6 size. The H6 is the smallest size tap we carry in the Capezio line of taps. Options that might be smaller would be the Super Taps in sizes OOO or OOOO. We have sizing charts for all of the taps we carry. Do these fit on character shoes? If so, is it only the Capezio brand that it works on. While these are a Capezio brand, they can be fit onto other brands (ie. Bloch, Sansha, etc) If you would like assistance sizing the Teletone Taps, please contact Customer Service. Do you only get 1 pair of just the toe taps or both the toe and the heel taps? When ordering these taps, you have to order one pair for the toes, and one pair for the heels. Please contact Customer Service for assistance in sizing the taps. Can these taps be used for clogging shoes???? If the clogging shoes are compatible with taps you should be able to purchase them. Does the Teletone Tap work with Balera Brand Shoes? Balera shoes are a Dancewearsolutions brand. You would need to follow up with them. 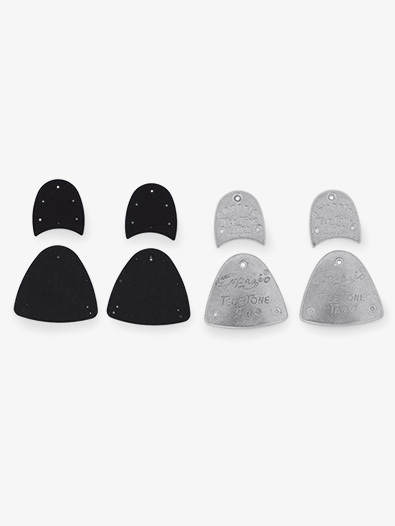 How do I know what size taps to order for my capezio 550 tap shoes? You will find the sizing for the taps when you click on the sizing tab next to the description tab. Do these taps come with the appropriate screws?